It’s amazing where you can find inspiration. Here are some of the things I’ve learned from those lovable, zany puppets. One of the discussions that comes up between me and my husband from time to time is “who is your favourite Muppet?” And this is a difficult thing to answer, although in the end I always settle on Gonzo as my favourite. For most of my life I’ve loved Gonzo. I always identified with his being different, and I absolutely loved that he was cool with being “weird”, because I never thought weird was bad and I always happily labelled myself as such. Now as an adult, I also pick up on other things I didn’t really gather when I was kid…like how Gonzo has a thing for birds, and that he loves pain. And, he’s actually fairly deep when it comes to his desires for discovering where he came from. That’s a pretty unique personality for a puppet. But Gonzo’s not the only one who has such interesting characteristics. Really, every Muppet character has a distinct personality. Fozzie is sweet and polite and desperate to be funny, even if he is just mostly pathetic. 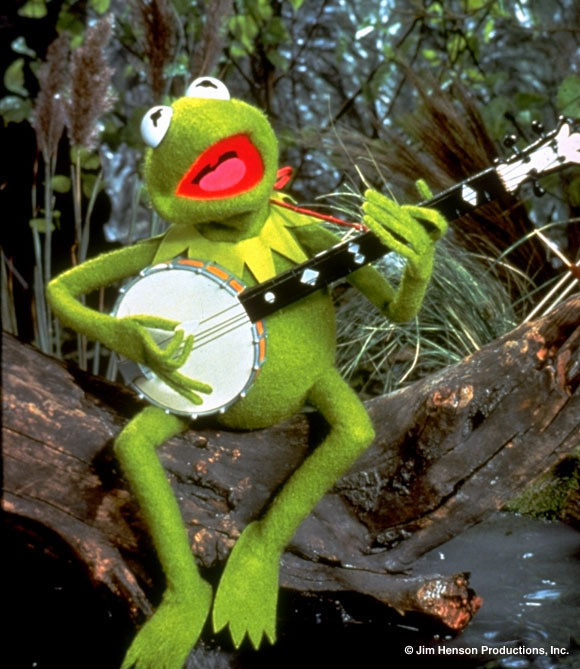 Kermit wants to make others happy, and he has a great heart, but a bit of a temper and some serious commitment issues. Sam the Eagle is serious, and seriously determined to uphold cultural values. Animal has to spend most of his time on a leash, but he is brilliant on the drums. And it goes on and on. Often, in books, I find that it’s fairly easy to identify your favourite character. Sometimes, there’s only one or two characters that would even be considered for this type of question. But the Muppets are such an interesting group because every one of them has a huge personality in some way or another, and with each Muppet being so truly individual, it adds so much depth to a cast of what on the surface seems a ridiculous group of rag-tag entertainers. Some books are awesome for this. But I see way too many stories that still uphold so many stereotypical characters. The boy who is amazingly good-looking, and who is either a total jerk, or a total sweetheart. The girl who is completely beautiful, but who for some reason doesn’t seem to realize this. The kid who is apparently rather unattractive and dorky (or so they themselves claim) and yet usually have no less than two people liking them at once. On the other hand, the Muppets offer brilliant characters like Miss Piggy. She is, of course, a pig. Not the typical ideal of attractiveness, and certainly not model-thin, either. But Miss Piggy has more confidence than any girl protagonist I think I’ve ever seen. She knows she is glamorous and beautiful. And if someone tells her otherwise? Well, they only make that mistake once. I also love Miss Piggy because she is a huge romantic, and always dreams of true love. But would you call her weak because of this? Would anyone dare call Miss Piggy weak?? The Muppets take traditional roles and totally mess them up. Kermit, obviously, is another great example of this. He’s a frog with a temper and a good heart but fears about settling down. Is he the typical dashing hero? No. Do frogs and pigs usually make the cutest couples? Probably not. But yet, you never question these characters in these worlds, even if they don’t fit the ideals of perfection, or the stereotypes of main characters. I’ve noticed in a lot of stories that things tend to go one of two ways. Either everything the protagonist does works out. Like, if there’s a bully in the book, I find the bully never wins, or the bad guy is always thwarted, and hero comes out victorious every time. OR, there is the opposite. The loser story. The protagonist can’t catch a break, and every possible situation goes horribly wrong, except for maybe, like, one thing at the very end that turns out okay. The Muppets, however, have always been an odd mix of greatness and utter terribleness. The Muppet Show is a horrible variety show. That’s the point! Time after time, song and dance numbers fail halfway through, and everyone in the cast realizes how disastrous everything is. But then, there are moments where this show brings its viewers beautiful renditions of songs, or hilarious little sketches. And its not at all unheard of for both the worst and the best moments to happen in the same half-hour show! It’s great that things can go either way for these guys. You never know what you’re going to get when this cast comes on your screen, and that’s wonderful. You see the ups and downs, as they experience them. And it helps you appreciate them so much more. I couldn’t finish a post on the Muppets without mentioning this. Your story does not have to be utterly epic, or crazily emotionally deep, in order to have a moment that could change someone’s life. Some books are these magnificent works of art from start to finish, and that’s wonderful. But sometimes I think the best stories are those ones that are just simply enjoyable, and then there’s a moment that makes it so much more than “just simply enjoyable”. It makes it special. The Muppets are like that. Watching these shows or movies, there are plenty of enjoyable moments. But every so often, something comes up that makes you smile or cry or just swell up with awe. Often this happens in songs. “Rainbow Connection”, “Bein’ Green”, “The Wishing Song”, “I’m Going to Go Back There Someday”. These are just a few examples. These moments can touch so deeply, but it happens amongst a fun and wacky ride that’s pure entertainment. And that is what makes it truly special. Honestly, I just love the Muppets, and I think they are incredibly inspirational in so many ways. How about you? Ever been inspired by this crazy, beautiful bunch? What a great post and what good comparisons you draw! You are so right that each of the Muppets is distinct. We feel that we know them too, and they behave in consistent ways. Great post! I echo Comment #1: Great post. I think if there's one thing writers can learn from the Muppets, it's to be unafraid to go zany. The Muppets and their stories are all over the place, with these (in some ways) completely improbable characters interacting with ordinary people and situations, taking it all to a new sort of reality. (One of my favorite movies as a kid, "The Muppets Take Manhattan", is a perfect example of this.) It's all pretty outside the box, and it's wonderful when creative people realize that the box is a guideline at best, never a prison. Thanks for sharing your thoughts on the matter. It's good to remember! I haven't actually, and that's why I'm glad you wrote this. For some reason I've had very limited exposure to the Muppets, so this was really cool to read! I especially like your point about stereotype-breaking.